The City of La Paz welcomes you to the greatest party on the peninsula - Carnaval La Paz. Stuffing your face at Carnaval La Paz is one of the fine points of the week. If all goes according to the usual scheduling around Fat Tuesday Carnaval La Paz will run from February 28 to March 5, 2019. 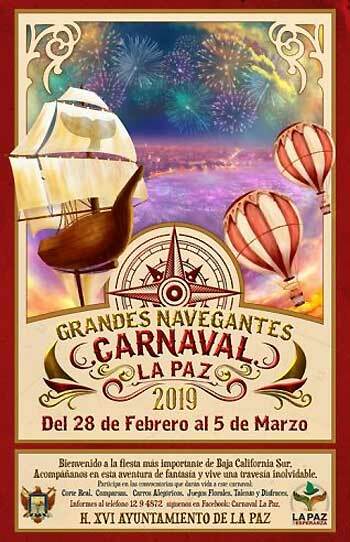 The theme for the 2019 Carnaval La Paz will be "Grandes Navegantes" (Great Navigators). Without a doubt Carnaval is the grandest event on the La Paz social calendar, drawing hundreds of thousands of people each year. There have been some significant changes to the headline performers on the Malecon main stage and for the first time in memory, a shuffling of the style of the acts and on which day they perform. Following the western Christian Easter Calendar Carnaval traditionally ends on Fat Tuesday, the day before Ash Wednesday. This means Carnaval can end as early as February 3 and as late as March 9th, so the 2019 Carnaval will be at the very late end of the spring calendar and temps could be nice and warm for activities along the Malecon. The late date of Carnaval usually means heavy attendance, if you're looking to make hotel reservations you will probably have difficulties after early-January. Carnaval has certainly become more sophisticated since my first one, 19 years ago. The last farm tractor hauled float was replaced in the parade some years ago, floats became more artistic, headline acts became top drawer and the whole thing just kept getting bigger. In fact, almost too big for the small city of La Paz. It seems hard to imagine, but in 2013, we almost saw the end of Carnival. The bill for Carnaval 2012 exceeded $880,000USD for the City of La Paz. With the constantly rising expectations, each year's committee felt the need to raise the bar. Carnaval events lead to national TV broadcasts of some of Carnaval La Paz in 2010. Apparently, it didn't lead to big 'Nielson Numbers' and it hasn't happened since. For the 2018 Carnaval there are rumblings in La Paz again with an expected cost to the city of close to $900,000USD. This year's $17 million pesos budget is 14% larger than 2017 and a 31% larger bill than that of 2013 budget of $12 million pesos. La Paz has grown commercially to cover a much wider area than that which benefits from the additional traffic of Carnaval. Many businesses in the Carnaval zone find the event significantly detrimental to business and those located in the outlying major commercial areas see reduced traffic. In 2019 controversy has reared its head in preparations with the resignation of a Carnaval Queen candidate and three other Carnaval participants due to lack of organization and accusations of cheating. One of the participants in the parade and prize winning marching demonstration La Academia de Zumba Venus announced it will not march for the first time in 10 years. Carnaval Queens are elected by the amount of donations collected, a vote per peso. A portion of these donations are collected in a box by the candidate's photo. The allegation suggest fund were moved from one candidate's box to another by or with the consent of a Carnaval official. Additionally, the 2018 Wuen of Carnaval has resigned, sighting poor treatment of the candidates and herself and lack of organization of the committee. This means that last year's queen will not participate in the delivery of the crown to his successor at the 2019 Carnival celebrations and the forwarding of the crown to the new queen. With smaller budgetrs for entertainment the calibre of the headlining acts is a tier or two lower than the star power we have enjoyed in previous years. If you come to Carnaval La Paz expecting bead tossing, drunken debauchery and things popping loose you might have to cover the young one's eyes for, it is not that kind of Carnaval. It is a family event, with more modest parades, food booths, and cultural events. Attended by a cross section of Baja California Sur, it is most popular with young people between the ages of 'tweens to early 20's. There are a king and a queen and some of the most beautiful women and a handful of men in La Paz come out of the woodwork to compete for this honor. Becoming Carnaval Queen or the King of Joy (Traditionally the title is "King of Fools") can be a big thing for a young person in La Paz. The job has its demands as well as the royal court not only is present during every night of Carnaval but also visits the jail, orphanage and old folks home to bring the spirit of Carnaval to those that can't attend. Coronation of the King usually takes place following the burning of Bad Humor in effigy on Thursday night. The queen and her court are crowned and presented on Friday night. Taking the crown is serious business in La Paz. In 2010 it was rumored that a family member of the Royal Runner-Up let the air out of the tires of the Queen's float because she felt the reigning queen had cheated to gain her throne. But who knows, it was just rumor, but it held up the parade for nearly 40 minutes. With just days to go before the 2019 La Paz Carnival begins, "Grandes Navegantes", February 28 to March 5 the Organizing Committee of this traditional La Paz Spring festival, unveiled the headlining artists that will be performing on the main stage. Budgets were severely cut for entertainment at this year's Carnaval La Paz, so attendees will see a lower tier of artists and only local talent will appear on Sunday night's main stage. February 28, It will be the comedian Gilberto Gless who will open these festivities, along with the burning of Bad Humor in effigy. The odds on favorites for this years bad humor are Nicolás Maduro of Venezuela and the perennial contender, Donald Trump. March 1, Francísco Céspedes, Jorge Muñiz and Carlos Cuevas, will delight the public with their show "Let's make a trio" as crooner vocalists. March 2, the Cumbia group, Sonora Dinamita will perform that night. March 4, Rebel Cats and their version of Mexican Rock-a-billy will perform on the main stage. March 5, The Hermosillo born female vocalist Yuridia will give the great closing to the celebration. Sonora Santanera will provide an alternative show at the Bellavista Club Casino and, on March 2, Patita de Perro will sing on the alternative stage at a location to be announced. The group Comparsa and Artte will be the main stage entertainment for the Children's Carnaval on March 10th. The parade nights always bring out the best crowds around 5:30PM (Sunday, Monday, and Tuesday, the last three nights) and the float costumes are about as racy as things get in this family town. The Gay community has its good share of the fun with Carnaval and some of the best floats in the parade are entries sponsored by that community. The parade traditionally starts from alternating ends of the Malecon. Sunday night it begins at the southwest end, at the intersection of Marcus de Leon. On Monday night it begins at thenortheast end of the Malecon near the Windmill and the beginning of the divided roadway. On Tuesday night it returns to the southwest end of the waterfront. The parade start times use to be one of the greatest Carnaval jokes, but the last several years the event has started promptly. . The main stage is located near the kiosk (bandstand) on the Malecon at the foot of 16th of September. This is where the Burning of Bad Humor in Effigy takes place to officially open Carnaval, most of the nightly performances take place and where the coronation event is held. Things start to fire up about sunset, with the main events on the stage taking place after 8 PM and dancing to live and loud music that continues to about 2 AM nightly. Stages featuring various musical acts from around Mexico and locally that cover much of the musical spectrum and range from 'pretty good' to 'why isn't someone recording these guys'. There are plenty of Carnaval trinkets and some little thing always ends up being the defining piece of junk for the year, ranging from hand-launched helicopters to glow in the dark mustaches. There are booths selling specialty bread, margaritas, and tacos, the smell of Carnaval food drifts over much of lower La Paz for almost a week. The booth space isn't cheap and many social organizations that count on funds raised during Carnaval to sustain them through the year have squealed about the increased fees. The election of the royal court is based on how much money they raise for the event. With donation boxes bearing their name and photo, votes are counted in pesos and result in a correlation. Despite the means of election, the resulting Queen of Carnaval usually has no shortage of 'guapa'. The King of Carnaval has often been a proud representative of the local gay community. In 2012 the King of Carnaval was seen as a little too 'queen' and pelted with items from the parade crowd until he was obligated to retire from the float mid-parade. This prompted the 2013 ban on throwing things at the parade float. Throwing items at the parade marchers is now a ticket-able offense. The press of the crowd, particularly near the bottleneck of the central stage can be intimidating. But the jam is usually handled in a friendly and laughing manner where you may sometimes find your feet leaving the ground for several meters of forward motion. Just like any mass gathering, Carnaval attracts those that prey on crowds, pickpockets, and petty thieves don't miss Carnaval La Paz either. Local "rateros" (the word is not "banditos") are joined by migratory mainland professionals, so keep a good hand on your cameras and keep what you take with you to a minimum. Police and Mexican military keep a pretty tight wrap on things and descend quickly on even the slightest sign of trouble. Without a doubt, Carnaval benefits commercial interests in La Paz and particularly the businesses closest to the action. It also interrupts life and businesses in the area that do not benefit from the increased traffic and disruption. For drivers in La Paz, the Malecon will begin to be obstructed on Monday, February 5 and be closed on Wednesday the 7 as the final setup takes place. Traffic will remain restricted through Wednesday, Feb 14 as clean up continues. Traffic flow along the Malecon from Marquis de Leon on the southwestern side to the Molina (windmill) on the northeastern end. Effectively crossing town after 8 PM will require traveling several blocks inland. The streets are swept daily during Carnaval and the mess seems to evaporate by about 10 AM daily, but it takes through the following week and Kid's Carnaval for some of the mechanical rides and booths to disappear completely from the Malecon. A little personal observation/opinion here: If you have never experienced Carnaval La Paz you might want to make a point of it in 2018, we just never know when it could be the last for a while. Support for the event from local merchants has drifted out of the downtown area that benefits most from Carnaval and now the event relies mostly on sponsorships. I do hope they can coordinate the continuance of the event; it is a true slice of La Paz. It's a piece of Baja California Sur folks, if you're in the area, don't miss out. If you miss out, we'll see you at the next Carnaval, we hope!